Welcome to A Little Cornish Home. The blog about the renovation of a 1920's semi with house building progress, DIY tips, Interior decorating and Interior ideas. Welcome to A Little Cornish Home. We are Amanda and James and together we are sharing with you our journey through moving to Cornwall and buying and renovating our first house. 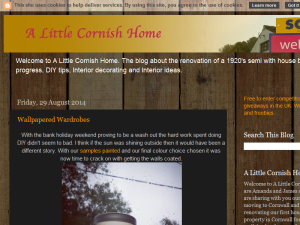 This what your A Little Cornish Home Blog Ad will look like to visitors! Of course you will want to use keywords and ad targeting to get the most out of your ad campaign! So purchase an ad space today before there all gone! If you are the owner of A Little Cornish Home, or someone who enjoys this blog why not upgrade it to a Featured Listing or Permanent Listing?